From the check out the Austin Hip-Hop Store on the right sidebar department... 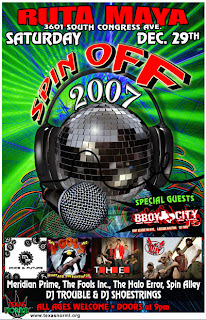 Spin Off 2007 @ Ruta Maya on Dec 29th with Meridian Prime, The Fools Inc., The Halo Error, Spin Alley, DJ Trouble & DJ Shoestring and B-Boy City! So I'd like to introduce you to the Austin Hip-Hop Store on the right sidebar... it's a PayPal widget so you can be certain that it's safe... as I get more products to sell, I'll add to the store... but for now, check out a couple of the hottest CDs in the Austin Hip-Hop Scene... Great Holiday Gifts!